NO ONE interested in the Irish Republican Brotherhood (the Fenians) can afford to ignore this first-hand account of how it came into being by the man who founded the movement. The diary has never been previously published in its entirety. Marta Ramón introduction provides an excellent background to the diary. James Stephens (1825-1901) was always something of a romantic figure, who was known as An Seabhach Siulach (The Wandering Hawk). He was a railway engineer from Kilkenny who took part in the Young Ireland uprising of 1848, was wounded at Ballingarry, and then escaped to Paris. Although he has been criticised as being no original thinker, no Wolfe Tone or James Connolly, nevertheless, he has to be accorded his place in history for his organisational and motivational abilities. In fact, one has to acknowledge that Stephens should be ranked among the best political organisers of the 19th century. He was certainly arrogant and dictatorial and dissension within the American branch of the movement caused him to be denounced as "a rogue, impostor and traitor". He was arrested and once again escaped to make his way back to Paris where he earned a precarious living from writing and teaching. The 1866 invasion of British North America and the 1867 uprising in Ireland destroyed the main impetus for a successful bid for independence at that time. Assured that Stephens would no longer be prosecuted, friends raised a public subscription to enable him to report to Ireland and live comfortably at Blackrock, Co Dublin until his death. His was the guiding hand that created and shaped the IRB into the longest surviving insurgency movement in Ireland, from whose base the modern Irish state finally emerged. He organised his movement on military lines. 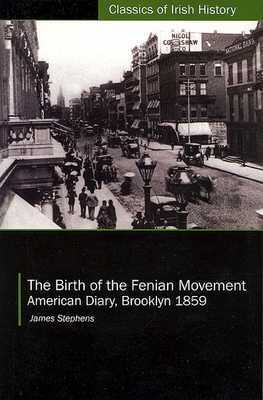 The diary is essential to understanding Stephen's role and is, as the publisher says, one of the most important documents of early Fenians. More important, for historians, it provides a unique insight to his fascinating personality. THE EDITOR introduces Stephens, placing him in the context of the 1848 Young Ireland aftermath and the origins of the IRB in the American Civil War aftermath. His 1858 diary offers insights into the thinking of the Irish-American emigrants, with their concept of having a role in a military liberation project. Key figures in the 1848 aftermath were John Mitchell and Michael Doheny, and the Irish Republican Union (IRU) was the organisational link, along with the Emmett Monument Association (EMA) associated with Doheny and John O'Mahony. We pick up in the Stephens diary some feel for the problems of knowing who is who, what their motivations are, whether they can be relied upon, are they good for money or military participation etc. The IRB was beginning to take shape as a military response to the British imperial system, at the time showing its true colours in the context of the 'Indian mutiny', with little evidence for the emergence of 'liberal democracy'. The author gives appendices with biographical notes on some key figures. This book is a source for research scholarship, rather than for the general reader. It is noteworthy that at this time, all over Europe, the military approach to the liberation of emergent nations from the various European imperial systms was the norm. Democracy had not developed to the extent that made possible the peaceful democratic secession of Norway from the Swedish empire. Those concerned with developing the potential of the Home Rule movement in Ireland in the 1900s looked to the latter model. This document was last modified by David Granville on 2009-09-07 16:18:30.